… will we ever see it on the roads? Motorcycle manufacturer Moto Morini has reported to be saved from the from bankruptcy by Paolo Berlusconi. Paolo Berlusconi is the brother of the italian Prime Minister and owns Garelli. He has made a €2.9 million offer for Moto Morini which includes the name, infrastructure and rights. Let us hope that somebody saves Moto Morini, the GranPasso is a fresh breath of air in the enduro world. Well, isn’t this what this blog talks about? Yes, but today we present you a way to make a long travel with your home and garage on wheels. Based on the Fiat Ducato Van it has enough place for a small family, and, your motorcycle. 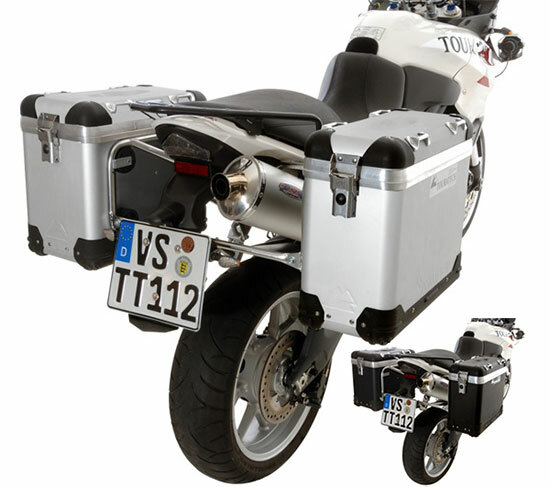 Besides of its incredible interior with everything you need to live with confort, the greatest characteristic of this Bürstner Argos van is the garage in the back where you can perfectly take your motorcycle with you and use it there where the roads get curvy. There is also place enough for bigger motorcycles. More of this van at Bürstner. 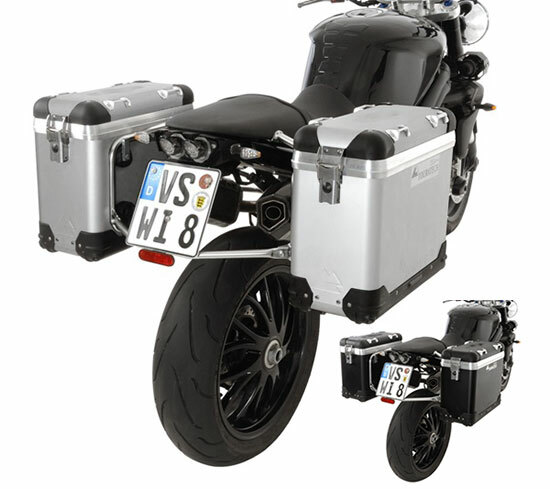 Famous for its travel accesories for motorbikes, Touratech now offers pannier racks for the Triumph Tiger and Street / Speed Triple in an elegant aluminium and anodized in black. They look really good on the Tiger 1050. Whilst they look normal on the Tiger 1050, as this bike is really well prepared for long travels, it took a time to accustom myself to a naked bike with racks and panniers, but I have to admit that the black ones look very elegant! Available in 31, 38 and 45 liter versions. Speed Triple with panniers, well, ok! 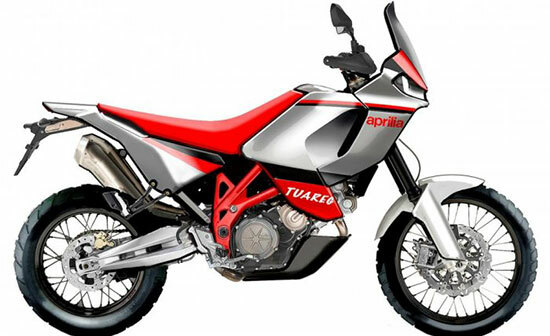 Yes, it seems that Aprilia is building a brandnew Aprilia Tuareg, based on the Shiver platform. 750 ccm v-twin motor, steel tube chassis, 21″ front wheel and a weight of under 200 kg, ready for the Dakar and other desert adventures. By now, no release date was published. The first visual releases Aprilias' rumors look good. 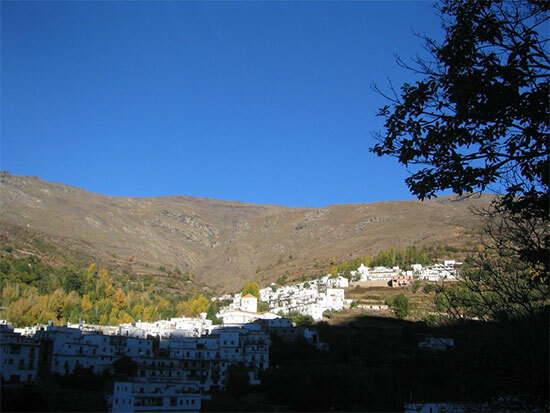 The Alpujarras is a mountainous district in Southern Spain, which stretches south from the Sierra Nevada mountains near Granada to the province of Granada and the eastern part lies in the province of Almería. The trip we show you today guides us to Trévelez, the highest village in Spain, 1476 m. Starting and ending in Málaga, it 294 km of great roads, first bordering the sea and then cruising on very pretty and curvy mountain roads through an amazing landscape. Curves and curves, in the Alpujarras. You should have lunch mid-route in Trévelez, the gastronomy there is simply delicious, the hams are famous. Bob Goddard (former bike journalist with articles in Motor Cycle News, Motorcycle Mechanics aso.) has now turned his hand to bike adventure books. 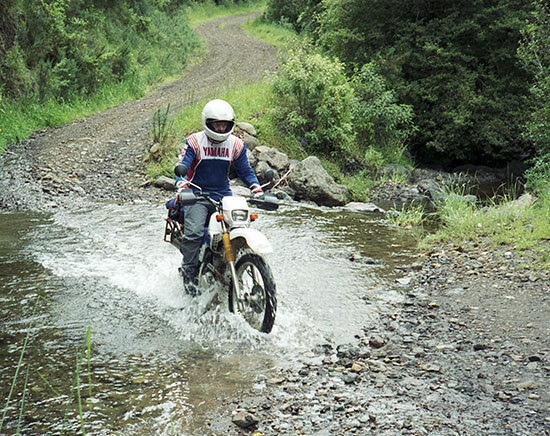 Bob and his wife Viv rode two trail bikes 11.000km through the New Zealand bush for the book “Land Of The Long Wild Road” and, more recently, to Eastern Europe for their book “Beyond Bucharest” and were lucky to get out alive! More details and books available here. Have a look at their videos about Beyond Bucharest and Land Of The Long Wild Road. 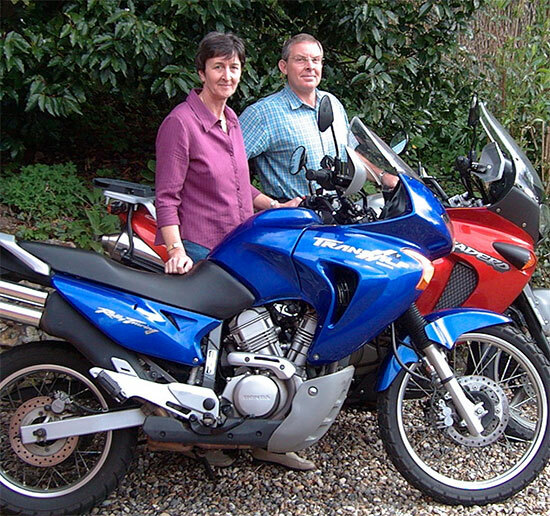 Bob, his wife Viv and their Hondas. One of the most notorious motorcycle travellers … he went twice around the world non stop and and registered his travel in the Guinness Book of World Records, as “the person who made the Longest Journey Around the World on a Motorcycle”. 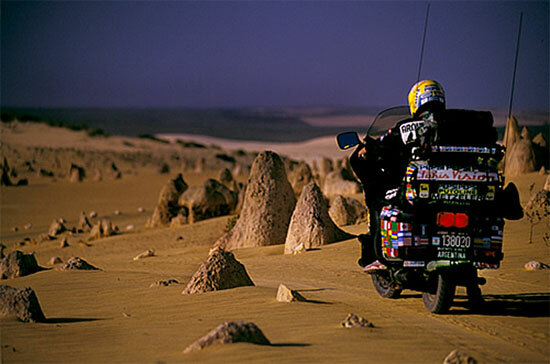 He traveled 735,000 km across 279 countries and territories in 10 years, on the famous “Black Princess”, his Honda Gold Wing 1100 motorcycle, one of the very big guys. Emilio Scotto on his Gold Wing in the desert. Back in 2008 he had another great project in mind: a journey of 100.000 km, the Caravan 2008 … can’t find any information about this project, the enroll form does not work, was this adventure cancelled? 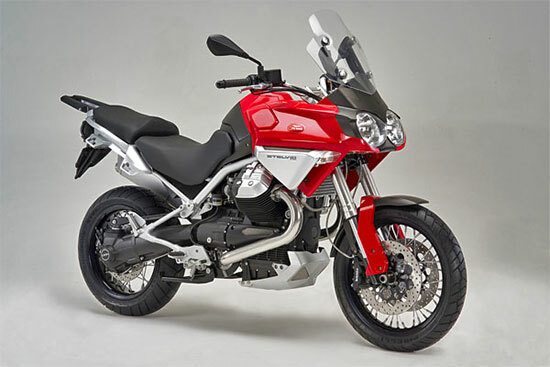 Last week we posted about the Ducati Multistrada 1200, today we present you another great italian touring motorcycle, very similar to the BMW R1200GS, the Moto Guzzi Stelvio 1200 with a very modern look and not so “edgy” as the BMW. Very pretty, well designed and finished bike. The bike uses upside-down forks and radially mounted front brakes. The Excel spoked rims in the sizes 110/90 ZR19 and 180/55 ZR17” with Pirelli Scorpion Sync tires are an excellent choice. 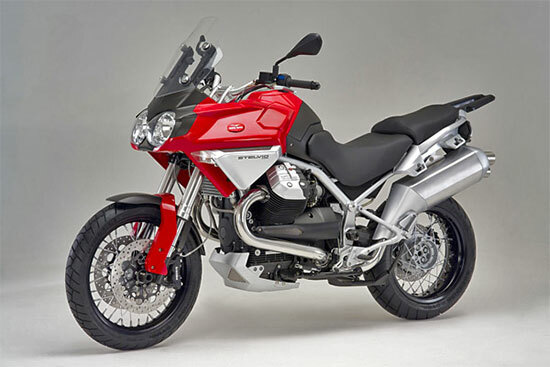 Specially in the rear part, it looks similar to the R1200GS. The turn signals on the Stelvio are integrated and the bike has fittings for saddlebags designed right in the frame, the rack is standard and many other accessories should be available. The Stelvio has a two-piece seat, the passenger seat looks quite comfortable. The Stelvio’s engine is the new Moto Guzzi 8-valve 1200cc engine, also present in the Griso. 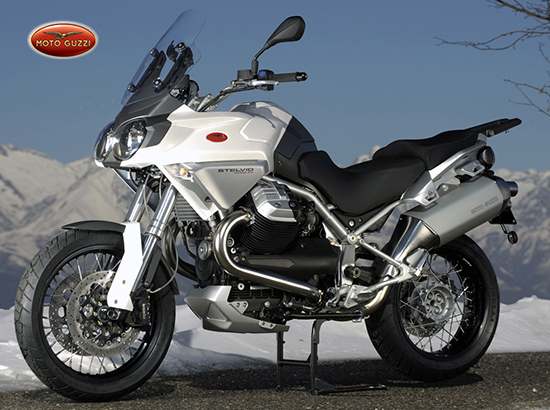 The Stelvio 1200 NTX ABS, have a look at the configurator at Moto Guzzi. More of the Stelvio: Moto Guzzi. Am I serious? No, this post is meant just for fun, for the very rainy and cold days, those days you prefer to keep your bike in the garage and your bones on the sofa … these games offer motorcycle touring in huge sandbox environments but no racing as ie. Tourist Trophy. Route 66: Travel down the world famous Route 66 with ‘Mad’ Madeleine Mayflower, as she takes a much needed vacation from motorcycle racing. 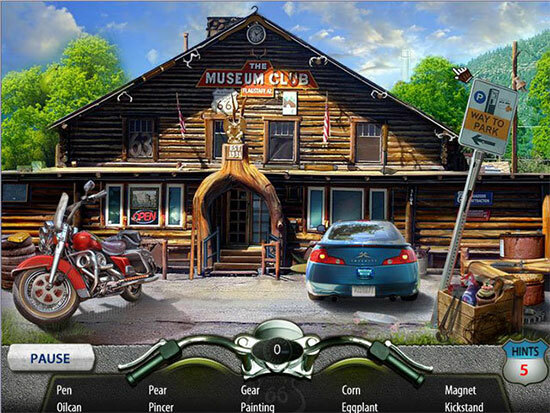 Explore hilarious and well-known tourist attractions as you make your way across Route 66 and through the very heart of America. For PCs. 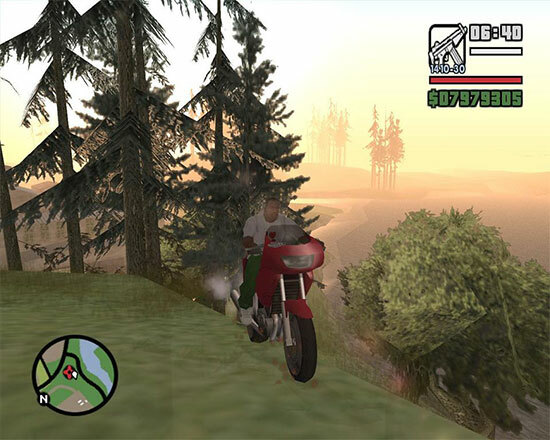 GTA San Andreas: With this well known game on the PS2 console you can explore a vast landscape through cities and countrysides riding touring bikes, choppers, aso. 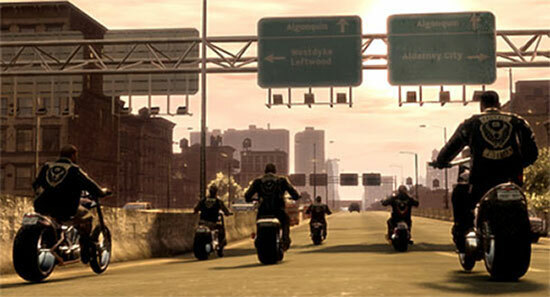 GTA4: With the sequel to GTA San Andreas, on the PS3, you get better graphics and higher quality bikes and environments, have a chopper tour through Liberty City with your friends. Ok, you’re right, it’s time for spring and real touring! Kind of road we will find a lot on this trip. We leave Málaga towards Coín and Alozaina where we find a very nice road, recently remodelated with good asphalt and low traffic in the morning hours. 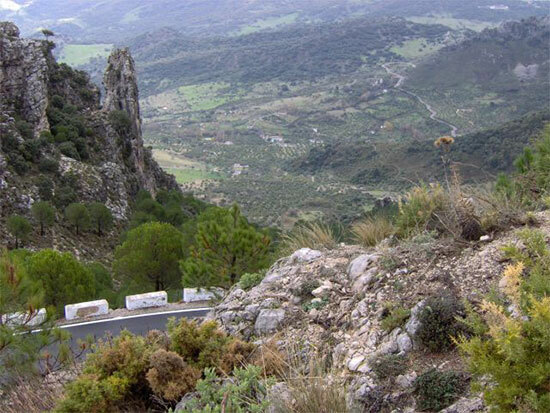 At Alozaina starts the maybe best section of the tour, well known by the local bikers, low speed curves on an inviting asphalt until we reach the Abejas Pass (820m) in the Sierra de las Nieves. We continue to the Viento Pas (1190m) and from here on we follow an old mountain road down to Ronda. We go on in direction Sevilla/Algodonales on a faster and more crowded road until we reach the exit to Grazalema. 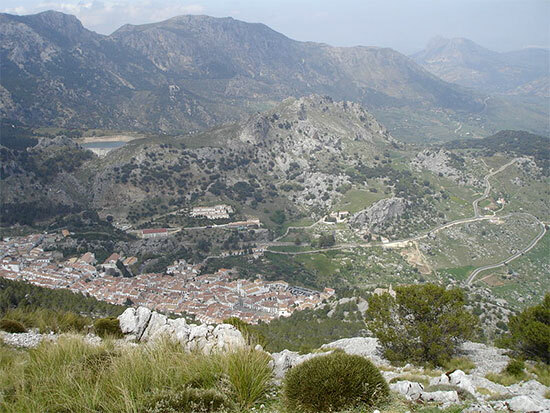 We cross a shady cork oaks forest and arrive at Grazalema. In this pintoresque village we should have lunch. Now we continue towards the Las Palomas Pass (1157m) to the north and ride down again on an incredible mountain road to Zahara de la Sierra, having a good view on the Zahara water reservoir. Back at the crossroad Sevilla/Algodales we head back on the Campillos – Jeréz route, at Campillos we take the deviation to Ardales / Málaga to avoid the crowded highway.